Casillero del Diablo Pinot Grigio is a popular Chilean White Wine available from Tesco Groceries in 75cl to buy online. Visit Tesco Groceries for the best price for 75cl of Casillero del Diablo Pinot Grigio or compare prices on our other Chilean White Wine products. Yellow straw in colour with mild green hues this medium bodied Pinot Grigio is full of energetic pear flavours with suggestions of citrus fruit and tangerine. Tender in structure with round and mouth filling with crisp acidity. Pairs well with smoked salmon, risotto or salads. Where to buy Casillero del Diablo Pinot Grigio ? Casillero del Diablo Pinot Grigio Supermarkets & Stockists. 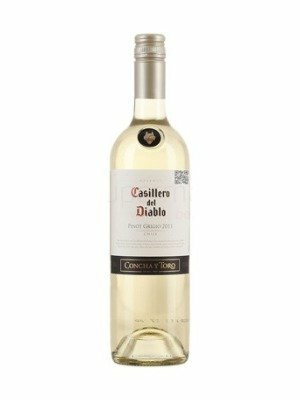 You can buy Casillero del Diablo Pinot Grigio online in most retailers and find it in the Chilean White Wine aisle in supermarkets but we found the best deals online for Casillero del Diablo Pinot Grigio in Tesco Groceries, DrinkSupermarket.com, Tesco Wine, and others. Compare the current price of Casillero del Diablo Pinot Grigio in 75cl size in the table of offers below. Simply click on the button to order Casillero del Diablo Pinot Grigio online now.